I picked up a pair of Electro Voice Evolve 50’s about 3 months ago and so far I’ve used them on more than 20 gigs. Here’s the good and the bad on how these speakers performed. 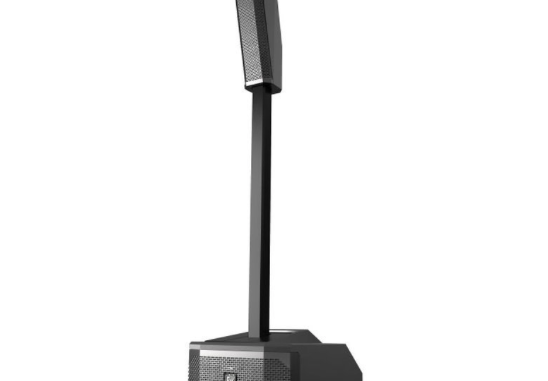 First, the Evolve 50 is what’s commonly known as a ‘column’ type speaker system. Lots of small speakers arranged vertically in a ‘column’ with a bass sub at the bottom. Many manufacturers produce column type speakers nowadays including RCF, LD Systems, DB Technologies, Turbosound, and of course not forgetting Bose who started the whole ball rolling with their L1 system. One of the biggest criticisms of column systems is that they don’t use high frequency horns. Instead, they use lots of little speakers – typically 2″ or 3″ drivers – to handle all the mid frequencies and high frequencies. The complaint is that if there’s no HF horns to handle the high frequencies, then the nice top-end sizzle you normally hear coming from traditional PA speakers is missing in column systems. The result of this is that most column systems suffer from sounding a bit “middle-y”. Some entertainers don’t mind this, especially guitar/vocalists. Guitar and vocals sound more prominent in the mid ranges of the frequency spectrum so the ‘missing’ top end isn’t so noticeable. However when playing full-range music through a column system the lack of a HF horn can become very noticeable. I’ve used quite a few column systems over the years from most manufacturers and I’ve played full-range music through all of them. I’ve had variable degrees of success in trying to squeeze the higher frequencies in the music out of each of them. Ultimately I’ve had to EQ every column system I’ve ever used quite aggressively just to coax anything approaching full-range frequencies from them. To make matters worse, when you aggressively EQ a speaker – especially to within an inch of its life – it rarely performs at its best. So how does the EV Evolve 50 fair when it comes to high frequencies? I can honestly say that out of all the column systems I have used, the EV does the best job by far in reproducing higher frequencies. These speakers sound every bit as good as regular 12″+horn boxes. You won’t be missing out on any of your top-end high frequencies when you use an Evolve 50. I’m not really sure how EV have achieved this where so many other manufacturers of column systems have failed. I can only guess that EV have maybe tweaked the DSP (Digital Signal Processing) inside the Evolve 50 to squeeze more high frequencies out of the 8x 3.5″ speakers than you would normally expect from them. Or maybe EV have just put better quality drivers in the Evolve 50, I don’t know. Perhaps it’s a bit of both. Where the Evolve 50 does fall down though (well, for me anyway) is in its overall volume/loudness. Don’t get me wrong, the Evolve 50 is loud. Its just not loud enough for large venues. To be fair, it wasn’t designed for blaring out full-range music loudly in large venues so it shouldn’t be a surprise to anyone that the limiter kicks in quite easily when you try to crank it up. However in small/medium venues where these speakers were designed to be used they sound absolutely lovely. The coverage is wide and the sound remains fairly constant throughout the venue. A pair of Evolve 50’s will easily out-perform the 12″+horn speakers that most entertainers in my neck of the woods currently use. In fact, I suspect most buyers of the Evolve 50 will be entertainers looking to upgrade from Mackie SRM’s, EV ZLX’s or similar. In these cases the Evolve 50 is a definite step up the ladder, plus they can be set up in a matter of seconds. Aesthetically they look much cleaner and smarter on a stage than a couple of big ugly speakers on tripod stands. One downside to the Evolve 50 which I feel is worth mentioning is the bass response from the 12″ woofer in the bottom section. It seems to struggle to keep up with the 8x 3.5″ speakers in the top section. The subwoofer sounds as if it’s doing a great job of thumping the bass out when you’re standing quite close to it, but walk a few feet out in front of the Evolve 50 and the bass drops significantly while the tops still manage to power the mids and highs far in to the room. I reckon if EV had put a 15″ subwoofer in the bottom section of the Evolve 50 it would’ve been a better match for the 8x 3.5″ top section. Then again, that would have introduced quite a bit more weight in to the Evolve 50 system and EV are trying to promote this system for it’s portability. They probably feel this is a fair trade-off. If you currently own any other type of column system, do yourself a favour and check out the Evolve 50, even if it’s just to hear how high frequencies can be successfully obtained from a column system. You’ll be impressed, I’m sure. If you currently use a couple of 12″+horn speakers on stands, you should also check out the Evolve 50. I think you’ll find it a big step up from your current speakers (unless you’re using expensive high-end 12’+horn boxes that is). If you currently use a pair of 15″+horn type speakers in your set up, you may find the bass severely lacking in the EV’s. I suggest sticking with your current system (unless you want to add an extra 15″ subwoofer or two to the Evolve 50’s). One last thing. You can actually hear yourself fairly clearly even when you’re standing on stage BEHIND the Evolve 50. I know it sounds a bit bizarre and it really shouldn’t happen but I’ve managed to do all my 20 or so gigs during the last 3 months with the Evolve 50’s without using any monitors on stage. I can hear everything pretty well, even though the EV’s are set up at the front of the stage and I’m behind them. With traditional PA systems, if I’m behind the speakers all I usually hear is a lot of woolly mush. Weird or what! This also means that when I use the EV’s there’s less gear to carry in to the gig and I like that…a lot!